Thanks. So I clicked your link but it takes you to TRS but there’s an error on the page. So I tried searching and it looks like that’s the ballast igniters and bulbs. No projectors though? 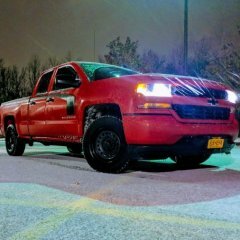 Does your truck have halogen projectors? Is that how it came from the factory or did it come with HID/LED projectors? With the retrofit, you are getting the Morimoto projectors, there is no apoxie or glue or anything like that. 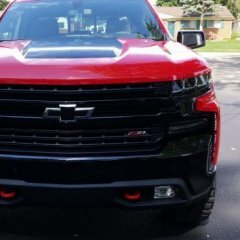 At least on the Silverado, maybe the sierra is different? You simply unscrew the dust covers unscrew your stock halogen projectors and install the new projectors that bolt on. The only problem is they stick back pretty far and your dust caps will not fit on. You have to cut them and then extend them with waterproof tape over the gap. Yeah man no problem. So many guys have helped me out on different forums over the years it feels good to give back and help somebody when possible. Give the retrofit source a call or check out light werkz and speak to Caesar. He’ll help you with whatever you need/want. Just posted a detailed explanation above. If you get a QUALITY HID bulb and ballast I'd say several years, also depends on usage hours. Spend more money on an OEM type bulb from Phillips or Osram and QUALITY ballasts. Damn.....just realized after I posted this that the thread is a few years old. 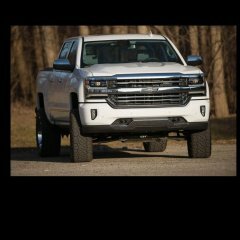 Well.....maybe it will help if anyone searches the forum with a 2014-2015 2500hd Silverado truck. Newdude, thanks a lot for posting and giving me that info! I actually just found that diode locally at a hobby store. I have seen pics of the 2 "ports" it goes into under the driver side floor area (BCM) Does it just get pushed into there and tension holds it in? Or does it need to "click" in somehow? I just want to make sure I do it right. Yes, I have the RZY installed per Pgamboa (Phil). My truck says manufactured 8/14 on the door. I saw the diode mod and if that’s what it takes it looks like something I can do. Just wondering what I should do since the dealer had my truck again. I was very adamant the white mirror lights should stay on when put in reverse. Well I’m getting ready to head to the dealership in about 30 minutes to drop the truck off for the fourth day now. However, in the meantime, I found a 2015 manual online and here is what it says about the tow mirrors with lights. Hopefully it’s a quick/simple fix and the technician just has one of the wires landed in the wrong ports or something like that. So my truck is a 2015 2500 HD LTZ. Came with the small mirrors with all of the functions. Switched over to the DQS tow mirrors with all the same functions and also the amber LED running lights and the white reverse /cargo lights. Let me give a huge thanks to Phil a.k.a. Pgamboa. He has PATIENTLY worked with me and answered all my questions that I’ve had which has been pretty much the past week. I bought OEM mirrors new harnesses for both front doors and the camper/jumper harness since my truck was manufactured 8/14 and is considered an early 2015. Took it into the dealer last Monday morning and dropped it off. To make a long story short they had it for THREE days! Finally got the truck and it appeared everything worked the way it should. Well that’s until this past Saturday night when I was backing up my dark driveway to hook a trailer up. 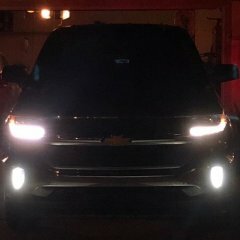 The white LED cargo/reverse lights in the mirror do not come on when the transmission is in reverse. Yes I put it in park and pushed the cargo light button which is on the dash below the HVAC controls and they came on. However, when I move the transmission to reverse they go off. They only come on when the truck is in park or neutral! So frustrated so mad. Needless to say I spoke with Phil again and he said that’s not right either. So here we go again, I’ll be dropping my truck back off at the dealership today or tomorrow. Not sure what to think at this point or what the technician needs to do. Clarification, I’m including the wiring harnesses with the mirrors as well. Will have the mirrors removed from truck tomorrow including the harnesses. Yeah, what he said!!! Come on slackers!!! Oh ok...so “premium”. Thought I would have better luck selling these. I guess no one really cares about mirrors unless they’re tow mirrors on a 2500 like me.